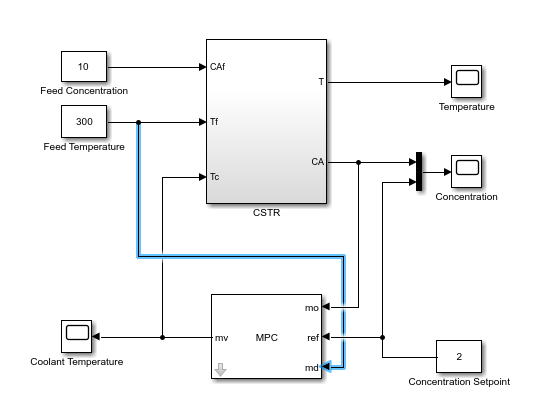 This example shows how to design a model predictive controller for a continuous stirred-tank reactor (CSTR) in Simulink® using MPC Designer. 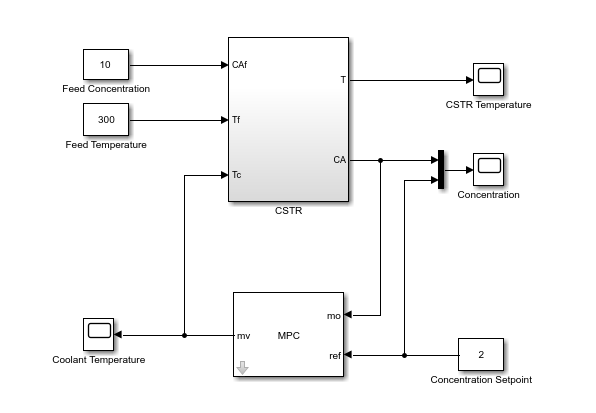 This example requires Simulink Control Design™ software to define the MPC structure by linearizing a nonlinear Simulink model. A CSTR is a jacketed nonadiabatic tank reactor commonly used in the process industry. An inlet stream of reagent A feeds into the tank at a constant rate. A first-order, irreversible, exothermic reaction takes place to produce the product stream, which exits the reactor at the same rate as the input stream. The control objective is to maintain the residual concentration, CA, at its nominal setpoint by adjusting the coolant temperature, Tc. 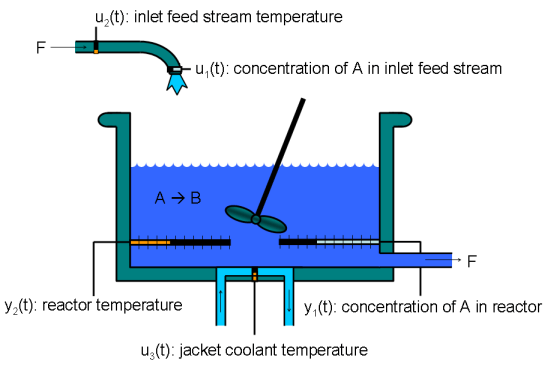 Changes in the feed concentration, CAi, and feed temperature, Ti, cause disturbances in the CSTR reaction. The reactor temperature, T, is usually controlled. However, for this example, ignore the reactor temperature, and assume that the residual concentration is measured directly. 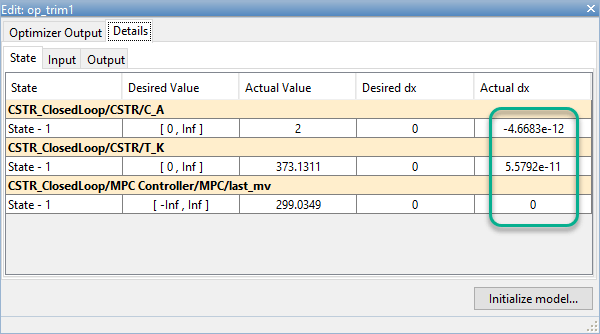 In the Simulink model window, double-click the MPC Controller block. In the Block Parameters dialog box, on the General tab, in the Additional Inports section, check the Measured disturbance (md) option. Click Apply to add the md inport to the controller block. In the Simulink model window, connect the Feed Temperature block output to the md inport. 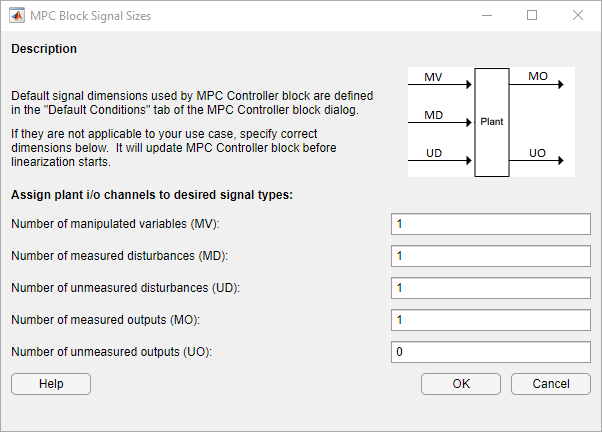 In the MPC Controller Block Parameters dialog box, click Design to open MPC Designer. In MPC Designer, on the MPC Designer tab, in the Structure section, click MPC Structure. In the Define MPC Structure By Linearization dialog box, in the Controller Sample Time section, specify a sample time of 0.1. In the MPC Structure section, click Change I/O Sizes to add the unmeasured disturbance and measured disturbance signal dimensions. In the Define MPC Structure By Linearization dialog box, in the Simulink Signals for Plant Inputs section, the app adds a row for Unmeasured Disturbances (UD). 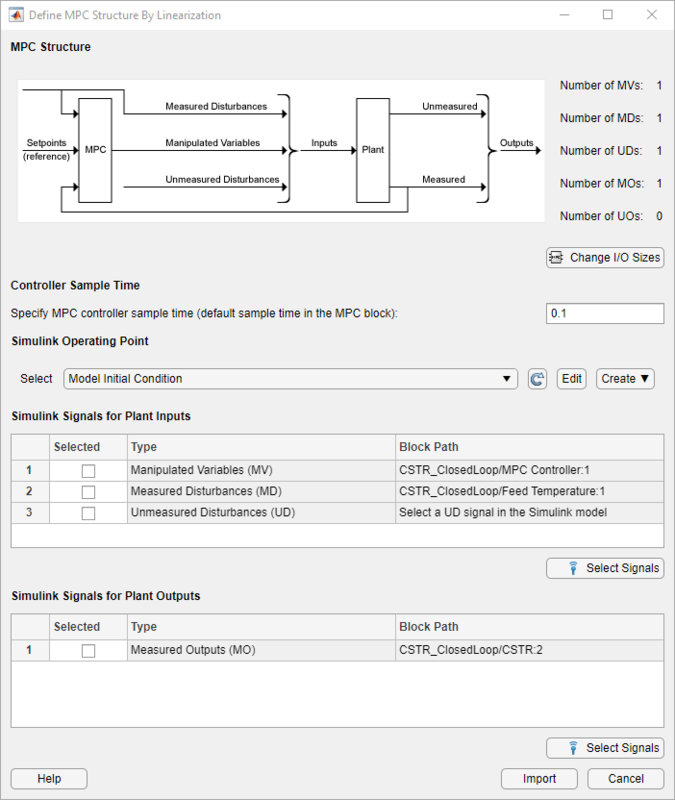 The manipulated variable, measured disturbance, and measured output are already assigned to their respective Simulink signal lines, which are connected to the MPC Controller block. In the Simulink Signals for Plant Inputs section, select the Unmeasured Disturbances (UD) row, and click Select Signals. 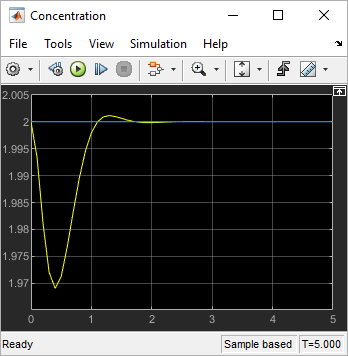 In the Simulink model window, click the output signal from the Feed Concentration block. The signal is highlighted and its block path is added to the Select Signal dialog box. In the Select Signals dialog box, click Add Signal(s). 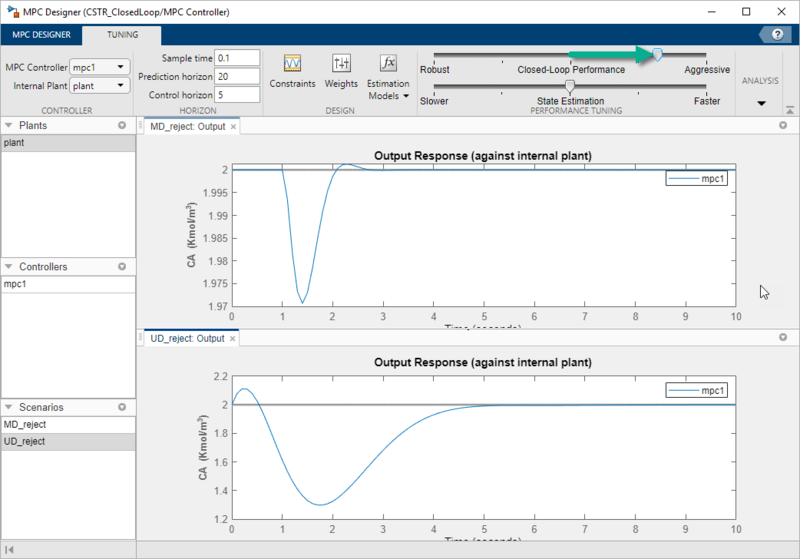 In the Define MPC Structure By Linearization dialog box, in the Simulink Signals for Plant Inputs table, the Block Path for the unmeasured disturbance signal is updated. 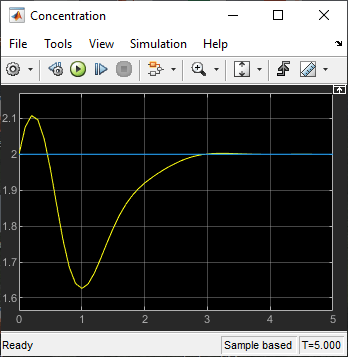 Linearize the Simulink model at a steady-state equilibrium operating point where the residual concentration is 2 kgmol/m3. To compute such an operating point, add the CA signal as a trim output constraint, and specify its target constraint value. In the Simulink model window, right-click the signal line connected to CA outport of the CSTR block, and click Linear Analysis Points > Trim Output Constraint. The CA signal can now be used to define output specifications for calculating a model steady-state operating point. In the Define MPC Structure By Linearization dialog box, in the Simulink Operating Point section, in the drop-down list, under Create New Operating Point, click Trim Model. 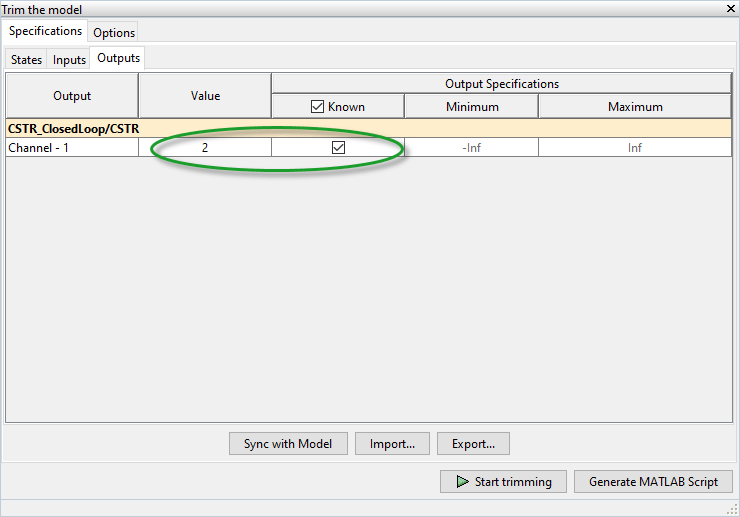 In the Trim the model dialog box, in the Outputs tab, check the box in the Known column for Channel-1 and specify a Value of 2. This setting constrains the value of the output signal during the operating point search to a known value. In the Define MPC Structure By Linearization dialog box, in the Simulink Operating Point section, the computed operating point, op_trim1, is added to the drop-down list and selected. In the drop-down list, under View/Edit, click Edit op_trim1. In the Edit dialog box, on the State tab, in the Actual dx column, the near-zero derivative values indicate that the computed operating point is at steady-state. Click Initialize model to set the initial states of the Simulink model to the operating point values in the Actual Values column. 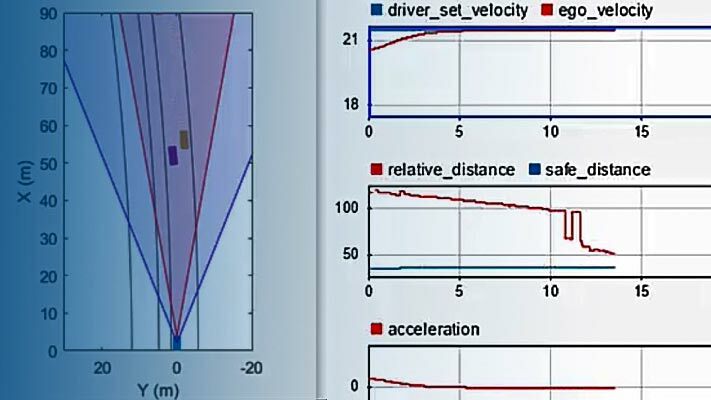 Doing so enables you to later simulate the Simulink model at the computed operating point rather than at the default model initial conditions. In the Initialize Model dialog box, click OK. When setting the model initial conditions, MPC Designer exports the operating point to the MATLAB® workspace. Also, in the Simulink Configuration Parameters dialog box, in the Data Import/Export section, it selects the Input and Initial state parameters and configures them to use the states and inputs in the exported operating point. To reset the model initial conditions, for example if you delete the exported operating point, clear the Input and Initial state parameters. Close the Edit dialog box. In the Define MPC Structure By Linearization dialog box, click Define and Linearize to linearize the model. On the MPC Designer tab, in the Structure section, click I/O Attributes. 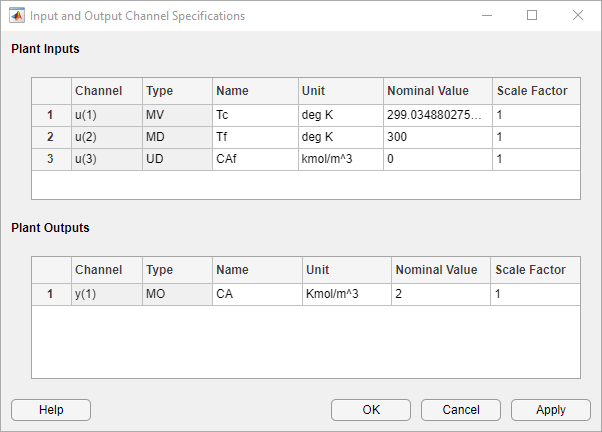 In the Input and Output Channel Specifications dialog box, in the Name column, specify meaningful names for each input and output channel. In the Unit column, specify appropriate units for each signal. The Nominal Value for each signal is the corresponding steady-state value at the computed operating point. The primary objective of the controller is to hold the residual concentration, CA, at the nominal value of 2 kgmol/m3. To do so, the controller must reject both measured and unmeasured disturbances. In the Scenario section, click Edit Scenario > scenario1. 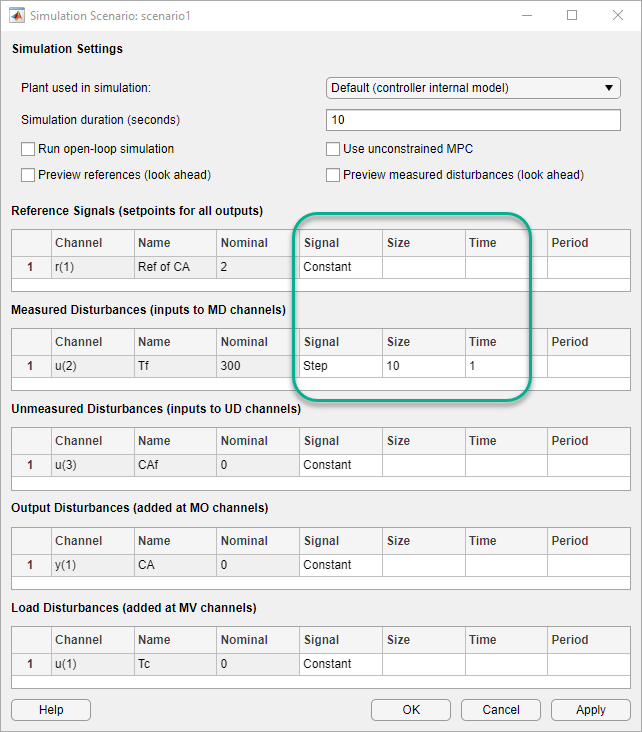 In the Simulation Scenario dialog box, in the Reference Signals table, in the Signal drop-down list select Constant to hold the output setpoint at its nominal value. In the Measured Disturbances table, in the Signal drop-down list, select Step. Specify a step Size of 10 and a step Time of 0. In the Data Browser, under Scenarios, double-click scenario1 and rename it MD_reject. In the Scenario section, click Plot Scenario > New Scenario. In the Simulation Scenario dialog box, in the Unmeasured Disturbances table, in the Signal drop-down list, select Step. Specify a step Size of 1 and a step Time of 0. In the Data Browser, under Scenarios, double-click NewScenario and rename it UD_reject. To make viewing the tuning results easier, arrange the plot area to display the Output Response plots for both scenarios at the same time. On the View tab, in the Tiles section, click Top/Bottom. The plot display area changes to display the Input Response plots above the Output Response plots. Drag the MD_reject: Output tab up to the top plot. In the Tuning tab, in the Horizon section, specify a Prediction horizon of 20 and a Control horizon of 5. The Output Response plots update based on the new horizon values. Use the default controller constraint and weight configurations. In the Performance Tuning section, drag the Closed-Loop Performance slider to the right, which leads to tighter control of outputs and more aggressive control moves. Drag the slider until the MD_reject: Output response reaches steady state in less than 2 seconds. Drag the State Estimation slider to the right, which leads to more aggressive unmeasured disturbance rejection. Drag the slider until the UD_reject: Output response reaches steady state in less than 3 seconds. In the Analysis section, click the Update and Simulate arrow . Under Update and Simulate, click Update Block Only. The app exports the tuned controller, mpc1, to the MATLAB workspace. In the Simulink model, the MPC Controller block is updated to use the exported controller. In the Simulink model window, change the simulation duration to 5 seconds. The model initial conditions are set to the nominal operating point used for linearization. Double-click the Feed Concentration block. In the Block Parameters dialog box, enter a Constant Value of 11 to simulate a unit step at time zero. In the Simulink model window, click Run. The Concentration output response is similar to the UD_reject response, however the settling time is around 1 second later. 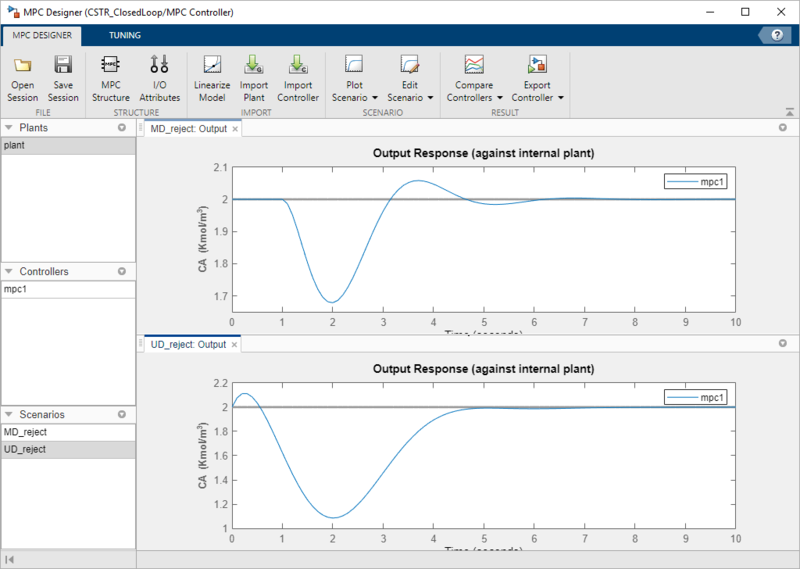 The different result is due to the mismatch between the linear plant used in the MPC Designer simulation and the nonlinear plant in the Simulink model. In the Block Parameters: Feed Concentration dialog box, enter a Constant Value of 10 to return the feed concentration to its nominal value. 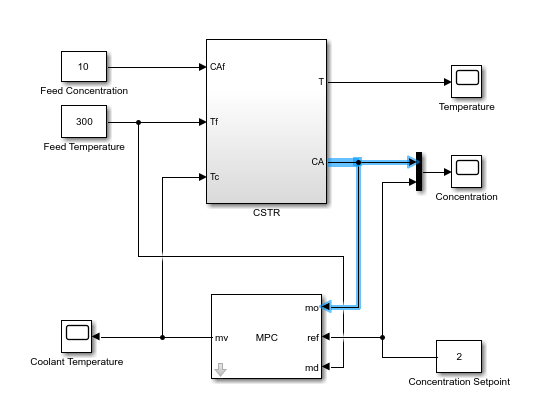 In the Simulink model window, double-click the Feed Temperature block. In the Block Parameters: Feed Temperature dialog box, enter a Constant Value of 310 to simulate a step change of size 10 at time zero. The Concentration output response is similar to the MD_reject response from the MPC Designer simulation.